Which Element Is Gollum On The LOTR Periodic Table? Funny you should ask! He is element number 91, abbreviated to Go. 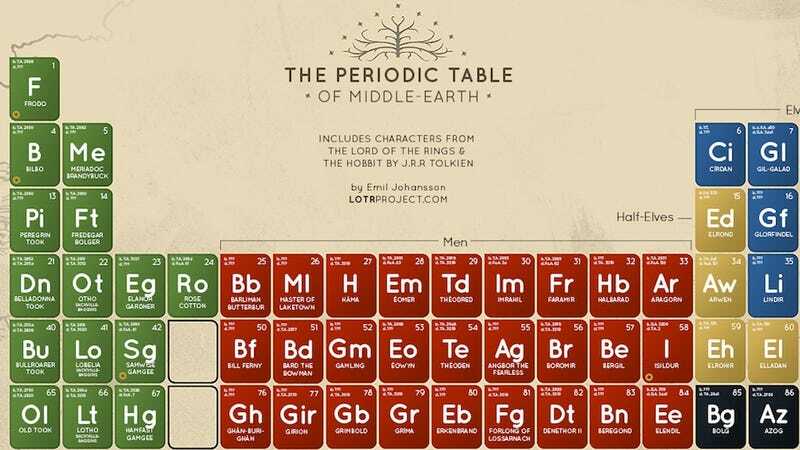 That comes via the "Periodic Table of Middle Earth," an amazingly thorough creation from the LOTR Project. The project, headed up by Swedish chemical engineering student Emil Johansson, is dedicated to assembling an exhaustive amount of data from J.R.R. Tolkien's worlds and creating detailed timelines, maps, genealogies, and, well, a periodic table. You can order the periodic table as a poster to hang on your wall. I'd love to see someone rewrite a passage from one of the books like the Breaking Bad opening credits, highlighting the element abbreviations in all the names. Check out the whole thing below (click to embiggen), and head on over to LOTR Project to check out the other stuff Johansson is up to.